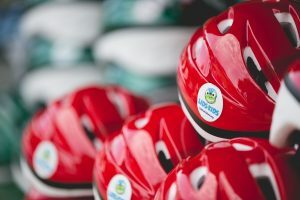 What: The premier bike helmet giveaway in Grand Rapids. When: Saturday, June 1, 2019 – 10 a.m. – 12 p.m.
Michigan kids and their families are invited to join us for the annual Lids for Kids event. Trained professionals and volunteers will properly fit each child with a free bike helmet and share helpful bicycle safety tips. Children in attendance and wearing their new helmet may also fill out a raffle ticket for entrance into a drawing with tons of prizes and a chance to win a FREE bike! With opportunities to meet local law officials and firefighters, tour a fire engine, and fun activities and games, there’s something for every kid and kid at heart! The Grand Rapids event is sponsored by the Sinas Dramis Law Firm and the Brain Injury Association of Michigan. Community partners include Grand Rapids Public Schools, FOX 17, Grand Rapids Fire Department, Hope Network, Mary Free Bed Rehabilitation Hospital, and Garfield Park Neighborhoods Association.